The New York Public Library recently released a digital archive of restaurant menus dating from 1851 to 2008. Not only have they digitized the historical menus they are in the process of crowdsourcing the transcriptions of the menus with 14,592 of 17,423 completed so far. This is opening up not only the menus but the data inside. For example it’s now incredibly easy to find out that macaroni and cheese appears on 33 individual menus and shows up as early as 1890. It also raises question such as why did the dish’s popularity spike in 1919? The NYPL is also offering up the data as a quick CSV download if you want to play with it and they have a public API of the menus (their first such effort) if that is your thing. 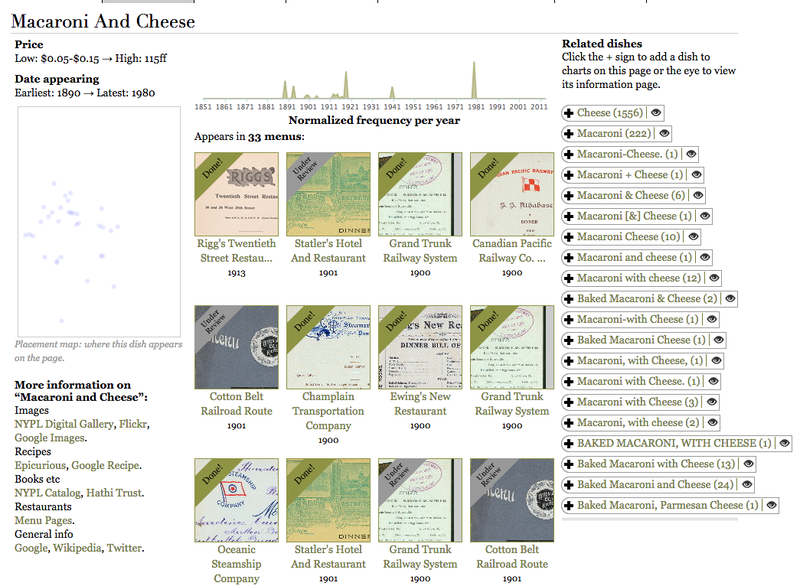 This digital archive represents a great open research resources for a variety of fields. For the design or marketing majors you could study the evolution of what the menu looks like. Or you could use it as a primary source in an economics paper on changing prices of a t-bone steak. For more resources on food scholarship here at Mcgill you can check out the open access journal CuiZine: The Journal of Canadian Food Cultures or you can come visit our Rare Books and Special Collections reading room and ask to see the cookbook collection. This entry was posted in Digital Resources and tagged Food scholarship, Menus -- Catalogs, Open Access, Open data by Sarah Severson. Bookmark the permalink.